The architects from Fraser Brown MacKenna Architects have created this summer home in Blackheath. 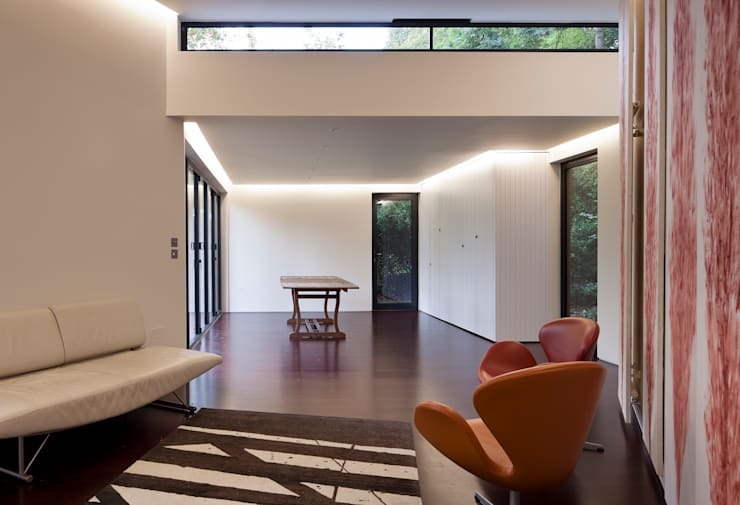 This tidy structure was designed for and by a renowned modernist architect, whose spouse also happens to be an acclaimed artist, and built with the help of the Fraser Brown MacKenna team. Together, they developed the concept of a new building formed from two interlocking cubes distinguished by a clerestory and angled obtusely, one extending to float above the slope of the site. The result is a playful, angular home that gives off a light, floating appearance as it harmonizes perfectly in the natural woodland surroundings. 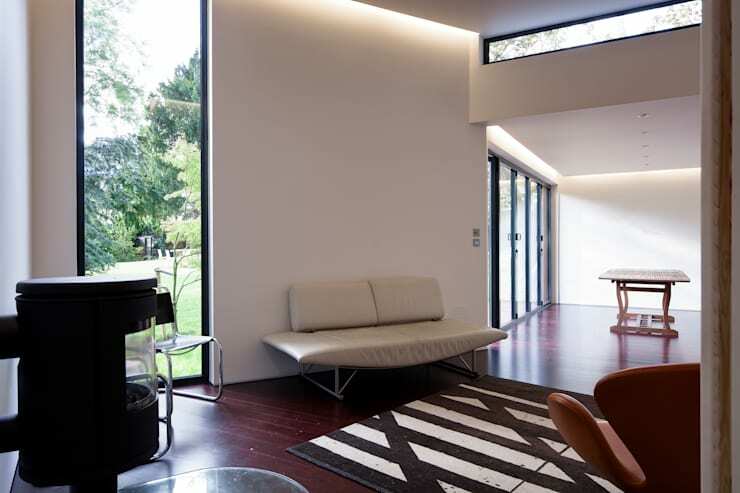 The building site for this small summer vacation home lies within the Blackheath conservation area; the listed, modernist house combined with the mature planting and topography of the garden provide a rich context to which the new building responds. Acting as a reflection of the surrounding forest, the exterior of the home has been constructed of wood, with a paneled area in a light teal hue that brings a healthy and natural green to the home's exterior. 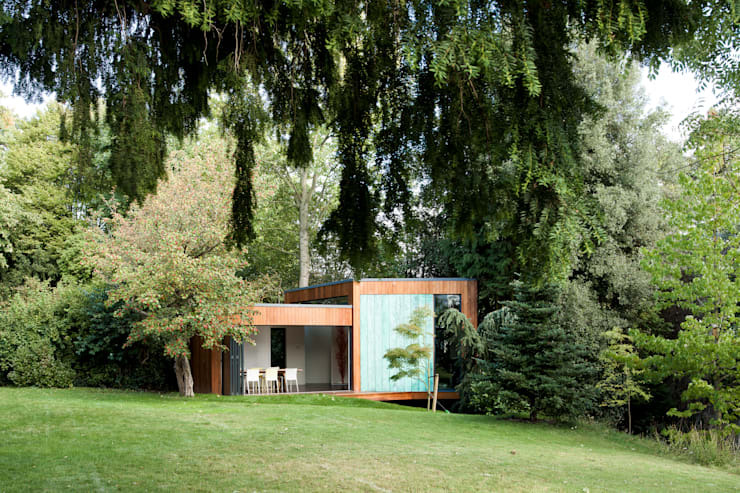 In locating the new summer house, the architects' goal was to work around the existing landscape and mature trees; as a result, the home occupies the sloping south-east corner of the site and faces out to the west, towards the house and garden. This position maximizes afternoon light. The rest of the design arose through close consultation with the artists as well as the local planning authority and civic groups, and was completed in September 2011. An interesting note about this home's construction: the teal copper panels on the ‘solid’ volume of the home were patinated by the artists and respond to rainfall and changing weather conditions. The new building is formed from two interconnected volumes, each of which provide different spatial qualities. A solid form appears to float above the slope of the site on the right, while a more transparent volume addresses the lawn. These two distinct masses of the structure create a space in which the home adopts two different tones, showing how even the smallest of spaces can enjoy a dramatic change in tone and mood from one room to the next. 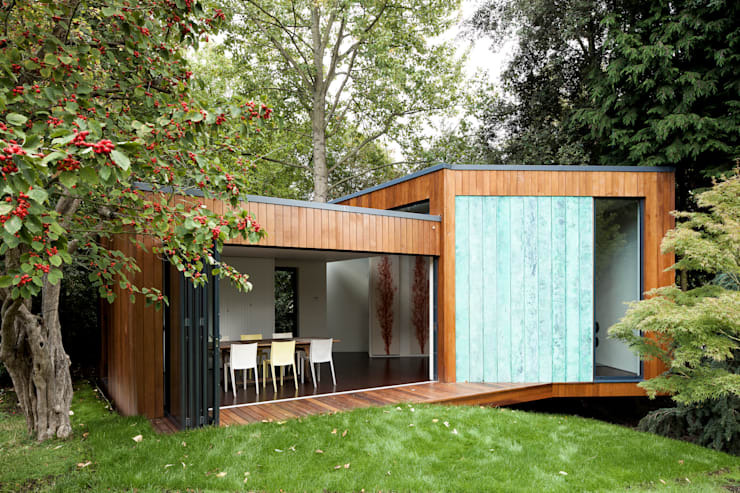 The bifolding door can be moved to establish a very open dialogue with the wooden deck and green lawn beyond the home, closely resembling a park pavilion where a family might enjoy an afternoon picnic. This open aspect is ideal for a summer home construction, and it also allows the couple to enjoy a feeling of spaciousness in a reasonably small structure. Looking for more compact home inspiration? Check out this sweet 500 sq ft home that a couple built on a tiny budget! 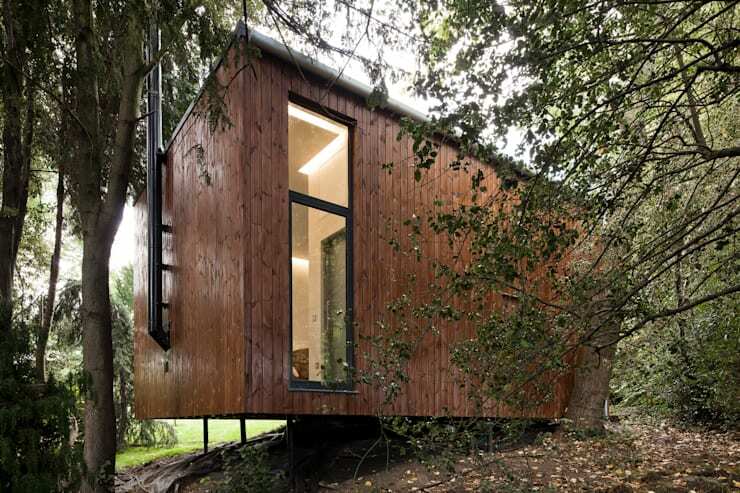 In an apparent effort to go scooting off the hillside, this home gains energy and momentum with this cantilevered construction that floats half the house above the ground. You'll observe a sleek black chimney sprouting from the side of the home. The building is highly insulated and airtight and has been wrapped in natural materials reflective the landscape setting, with small splashes of polish (as you see in the sleek black chimney). Inside, the home is filled with a dramatic, dynamic sensation as light and shadows mix from the various sizes and positions of windows letting light into the home. An array of black and white furniture furthers this high-contrast look, creating a space that finds balance between two extremes. From this point of view, it becomes apparent how different the two masses of the home really are. Although they enjoy one unified floor, the living room and the dining room offer entirely different moods. The living room is enclosed and intimate, while the dining room is fresh and open. As you'd expect from a house designed by two acclaimed artists, this home features some very artistic details. In this image, you can observe the long, vertical paintings that adorn the walls in a repetitive pattern. 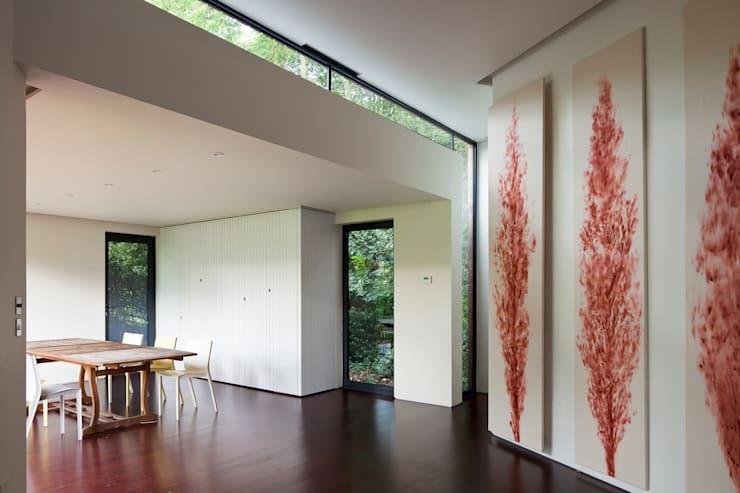 This work of modern and abstract art doesn't stray from the organic summer home feel, however – the leafy designs that they display match perfectly with the forest beyond. Another artistic detail of this home is the way the dining room section has been given a frame – literally – with the window that stretches along the boundaries of the area. This design feature not only lets in light, but it also pushes the dining room area away into a more wild, natural atmosphere, enhancing the pavilion-like feel of a picnic table at a park.